Freezing pipes: messy, expensive and a huge pain to deal with. The plumbers at Troudt Plumbing in Greeley, CO have some words of advice for homeowners on how to deal with the problem. The first step is obvious: Keep your pipes warm enough in the winter. 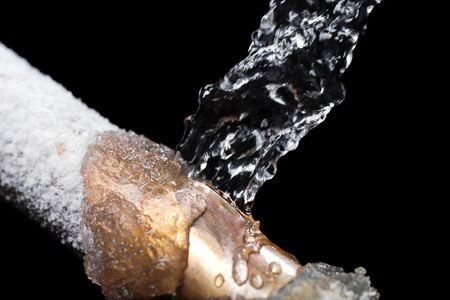 Pipes are at risk of freezing and bursting when exposed to severe cold. Freezing water expands, and at some point, the pressure of the frozen water is too much for the pipe, and it bursts. You’ll notice you don’t have water flowing in your home…but when the pipe thaws, there will be water flowing in places you don’t want it…and unfortunately, money flowing into repair work. Make it a habit to drain your lawn sprinkler system before the first hard freeze. While you’re out there, remove, drain and store all your outdoor hoses, too. Check around your home and know where your water supply lines are located. Look in the basement, the crawl space, the garage, the attic, and under kitchen and bathroom cabinets. And when the temperature drops below freezing, especially if it remains that way for several days in a row, do leave a sink faucet running. Once you know where the water enters your home from the outside you can choose a sink as far away from that point as possible. This allows the water to flow through all the pipes under your home on its way to the faucet. Remember too, if you’re planning to be away from home during the cold weather, never set the thermostat below a steady 55 degrees, day and night. And If You Do Find A Frozen Spot? It’s often best to call your plumber and let a professional find the frozen area and thaw the pipe. If you need our services, please contact us.